The objective of this paper is to assess the need and the importance of Islamic fashion in the world. The issues highlighted are the evolution of Islamic fashion, the acceptance of modest fashion globally as well as Muslims’ spending on clothing. 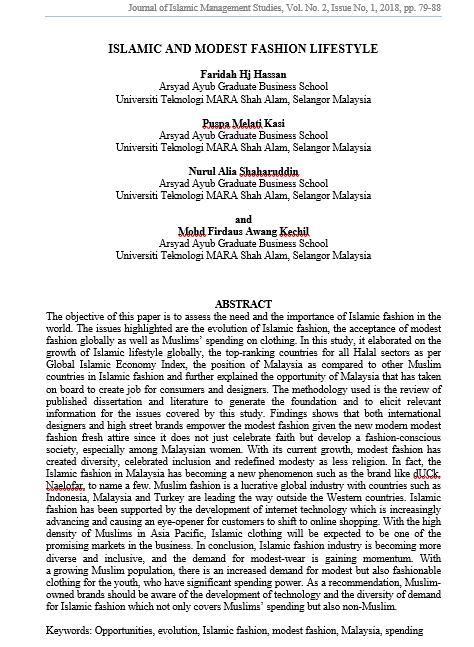 In this study, it elaborated on the growth of Islamic lifestyle globally, the top-ranking countries for all Halal sectors as per Global Islamic Economy Index, the position of Malaysia as compared to other Muslim countries in Islamic fashion and further explained the opportunity of Malaysia that has taken on board to create job for consumers and designers. The methodology used is the review of published dissertation and literature to generate the foundation and to elicit relevant information for the issues covered by this study. Findings shows that both international designers and high street brands empower the modest fashion given the new modern modest fashion fresh attire since it does not just celebrate faith but develop a fashion-conscious society, especially among Malaysian women. With its current growth, modest fashion has created diversity, celebrated inclusion and redefined modesty as less religion. In fact, the Islamic fashion in Malaysia has becoming a new phenomenon such as the brand like dUCk, Naelofar, to name a few. Muslim fashion is a lucrative global industry with countries such as Indonesia, Malaysia and Turkey are leading the way outside the Western countries. Islamic fashion has been supported by the development of internet technology which is increasingly advancing and causing an eye-opener for customers to shift to online shopping. With the high density of Muslims in Asia Pacific, Islamic clothing will be expected to be one of the promising markets in the business. In conclusion, Islamic fashion industry is becoming more diverse and inclusive, and the demand for modest-wear is gaining momentum. With a growing Muslim population, there is an increased demand for modest but also fashionable clothing for the youth, who have significant spending power. As a recommendation, Muslim-owned brands should be aware of the development of technology and the diversity of demand for Islamic fashion which not only covers Muslims’ spending but also non-Muslim. HJ HASSAN, Faridah et al. ISLAMIC AND MODEST FASHION LIFESTYLE. Journal of Islamic Management Studies, [S.l. ], v. 2, n. 1, p. 79-88, mar. 2019. ISSN 2600-7126. Available at: <http://publications.waim.my/index.php/jims/article/view/101>. Date accessed: 24 apr. 2019.